Let's start with some news about the Association of Tarot Studies conference. I'm very excited about giving a keynote speech! I'll be presenting my latest research in a talk called Alchemy, TheoSophia and Tarot. 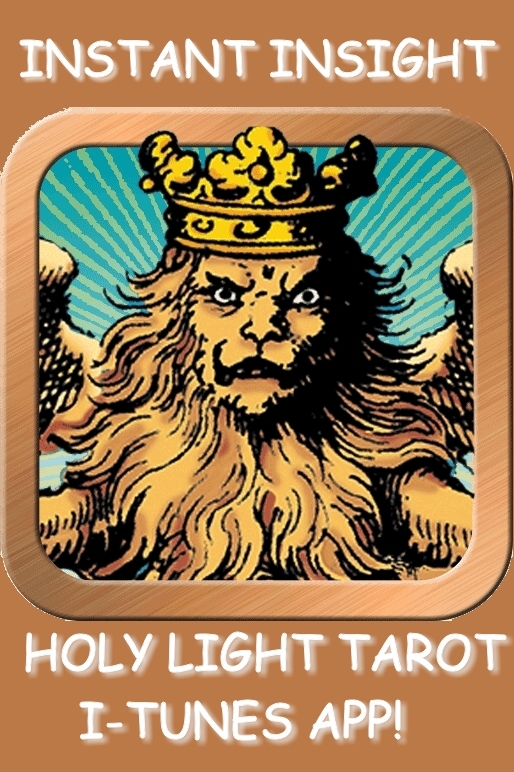 I will also be using the occasion to unveil the first Continental Tarot deck of the 21st Century, and its accompanying book, entitled The Tarot of the Holy Light. Both have been created by and with my partner Michael Dowers. Attendance is limited by the size of the venue so don't delay! I had a conversation last week that informed me in no uncertain terms that when I talk about Tarot Esotericism, there is a continental-sized gap between what I am referring to and what the average Tarot-interested listener might imagine. The casual and generic way that the word "esoteric" is being used in common parlance seems to be the source of the disconnect. These days the word 'esoteric' seems to function as a placeholder or cipher, like an empty vase, rather than a knowledge-filled category pregnant with meaning. For so many, 'esoteric' is a fig-leaf concept used to cover up things that they would simply rather not think deeply about. This is a paradox, because the Tarot community as a whole seems to love and adore using the terminology of esotericism to flesh out their understanding of the Tarot. One can hear (and see) references to astrology, sacred alphabets, chakras, elements, sacred geometry, kabala, Gnosticism, magic -- all of the technical vocabulary and imagery of esotericism is on display in the faces of the Tarot cards. This leaves me more than a little puzzled why our Tarot community, which so loves the "look and feel" of that catalogue, doesn't want to get down to cases and actually learn what these things inherently are and historically refer to? The symbolism appears everywhere, but a bedrock grasp of the traditional content of the symbolism appears to have never filled in. Recently I moved my library around. The task was to refine the ordering of books to reflect the unfolding discussions in our field. Doing so caused me to ruminate on the parallelisms between the esoteric disciplines of the ages. I was simultaneously re-reading through Harold Bloom's Omens of Millennium as I do every year. Having these two things going at once really drove home for me the fractal nature of the world's religions and esoteric paradigms. When the multiple related but highly individuated traditions are superimposed (as Bloom does so effortlessly), certain issues arise over and over, representing as they do the common substrate of human experience. This is the area that holds most interest for me, because it is at the baseline, standing on common ground, where we might be able to discern the direction(s) that human evolution is unfolding. There are certainly different ways of testing the above theory, but the defining proof of our common foundations comes in the form of Stephen Skinner's The Complete Magicians Tables. Skinner found it possible, necessary, and sufficient to collate his global assemblage of symbolic, magical and esoteric paradigms from the world's cultures under an essentially simple master Key. Using categories of 10 (Numbers), 5 (Elements, 3 pure and 2 mixed, sometimes expanded to include an Underworld), 7 (Planets) and 12 (Signs) Skinner has demonstrated that there is only one Mystery, and all the divergences and variations show themselves to be more matters of vocabulary and local cultural usage than essential differences based on core concepts. This is by no means an unreserved plug for Skinner's Tables. He commits what is to me a cardinal Tarot sin: he integrates OGD (Order of the Golden Dawn) material all through a historical presentation of true esoteric tradition, and further he makes it hard for the neophyte to discern what parts of his graphs actually come to us from antiquity versus those parts that were imposed upon history after the fact.Astoundingly, he also repeats the long-discredited nasty rumor that the body of correspondences shared by Eliphas Levi in his writings about magic is "blinded" in a way that called forth the revisionist Tarots from the English stream to correct the record. (p. 420) How long will this charade persist? Given what is evident upon the face of historical tradition, Levi was a fount of traditional fidelity compared to Mathers, Waite, Crowley and their wake! This is what allows him to skip over the one-to-one connection that has for centuries existed between the Trumps and their standard numbers, which link back to every ancient sacred alphabet (such as Hebrew, Latin or Greek). Because Skinner made this choice to ignore the first 500 years of Tarot decks in his compendium, the book reveals itself to be deceptively flawed, though still representing a tremendous labor of love. By making this choice, Skinner reduced his contribution to being yet another OGD attempt to inscribe the patchwork of modern occult revisionism over the top of longstanding usage. Skinner might more honestly have spelled the titled Magician with a 'k', for truth in labeling. Let's look on the bright side anyway, just to be ornery. We can see that even though Skinner is no partisan of traditional Tarot (or Tradition either, except as it serves his occult politics), he still couldn't find a more fitting way to display the worldwide conventions of magic than by organizing his tables within these governing esoteric categories -- numbers, signs, planets and elements. As I have stated unreservedly starting more than a decade ago, these are the categories that also determine the internal structure of Tarot. Skinner has demonstrated this anew by piling up the world's varied pantheons, symbol-sets, esoteric disciplines and mythic correspondences, demonstrating beyond question that they all resolve down to same numbers, letters, signs, planets and elements. Whether we are talking about alchemy, kabala, astrology, runes, magic, talismanics, geomancy, the god forms of various tribes and cultures, or any other reality-model, the core Mystery is shared, communal. AND it is astro-alpha-numeric. It appears there's very little room for seeing things in any other light." In the light of this basic architectonic fact, that all the Mysteries pertain to and hang from the Zodiac, the Visible Planets, the Elements and the Numbers, certain things should become clear to the intellectually honest Tarotist. For one thing, it is time to put to rest the declarations from Jung and Waite to the effect that "Magical practice from before the modern era was a tangled mass of imponderable and unexplainable chaos". This is an incorrect assumption and it has led to ignorance and distortion. True, when Jung and Waite were writing, people like Skinner and myself were not on hand to help them sort out the finer implications of magical practice (though one wonders why Waite lacked the wherewithal to do so). Nowadays we are half a century away from those old limitations, and especially with the help of computers and the Internet, we have a truly astounding trove of research to fall back on. It's all out there for free, as these ArkLetters prove. There is no excuse for continuing to hide behind those intellectually-lazy old rationalizations, which were designed to allow moderns to justify ignoring the fundamentals (you don't have to learn anything about historical magic, just take our testimony on faith!) while still enabling neophytes to play around with magical, mystical vocabulary and feel "cool". For another thing, if one actually studies and operates within the magical paradigm (meaning specifically astrology and sacred geometry applied to the chakras of the energy-body, and self-cultivation with these tools over time), then you have to know that these values aren't relative, You cannot break the correspondences, hook them back together a different way, and somehow still get the same results. That would be like taking your toaster apart, putting it back together "freeform", and still expecting it to make great toast! Thus it would seem that at least the professionals would want to ground themselves first in the historical and traditional usages, learning the methods defined by our ancestors who sent these symbols and ideas forward through the ages. After all, the Zodiac has been a standard value, the Planets have always been with us, the whole Numbers never change their natures no matter how many times we add, subtract, multiply and divide them, and the Letters have steady correspondences to these values that date back more than 2000 years. Every aspect of the magical paradigm has existed from antiquity, and none of those values have changed their essential referents for millennia. Not until the 20th century, that is. I make my assertions very self-consciously, perfectly aware of the poignant time that humanity is entering. A rootless culture based on tricking Nature and reprogramming our natural habits towards technological artifice is leaving people aghast and disillusioned about the so-called benefits of "modernity". We are sick from fake foods and the chemicals we use to mask their depredations. The environment is reeling from the onslaught of our greed and rapaciousness disguised as innovation. Entire species are migrating right off the planet because we leave them no safe and healthy space to live. Even we over privileged first-worlders can't help but notice that there are limits to how much we can dictate terms to reality, before we run up against boundaries that we cannot overtop. In the face of the vast artificiality that we have been sold in the name of culture, we are all longing for something grounded, authentic, fundamental, natural and stable as a point of reference. This has to be true in the Tarot world as well as every other facet of life. In parallel with the heirloom homegrown vegetable trend that's increasing every day, the downsizing theme that reminds people how to live in a smaller and less industrial footprint, and the Natural Health movement that is turning people back to herbs, nutrition and meditation for health care, it's time for a "return to basics" in the Tarot world as well. Those basics are the Zodiac, the Planets, the Numbers and the Elements. These values comprise the literal referents for the Letters, providing the individual meanings of the Tarot cards as well as the vocabulary of alchemy, the content of the Kabala revelations and the secret meanings of all the symbols and correspondences found in the Esoteric Paradigm. From Lull's wheels to Dee's Monas, from the Geomantic figures to Etteilla's Tarot, the core concepts remain remarkably consistent and stable. Only in the 20th century have these core associations been called into question. To speak very frankly in the wake of the unspeakable world tragedy that is playing out in Japan as I write, it is imperative for humanity to contact our spiritual and psychological roots right now. I say this not only because of the spiritual and moral shaking we are all receiving as we watch the nightmare of nuclear meltdown playing out in real time -- which can't help but call all of the values that created such a monster into question. But also, if the already-well-underway extinctions of the other animals off the planet have anything to say to humans, it might be time to think seriously about the legacy we are leaving to the future of Earth. What are we sending down into posterity for others to deal with? What do we want to bequeath to the future of humanity? It's clear that one of the things future humanity has to look forward to is a plague of radioactivity circling the globe. But what else do we want them to know about us? As I have said before, all of my Tarot teachers were dead when I found them. As far as I can tell, the majority of my students will find me in exactly the same circumstances. To thank my teachers for their labors of love and scholarship, I have to write as fast as I can study, sending articles and Tarot decks into the future where I won't be able to go bodily. Maybe it's Mars in Sagittarius on my natal midheaven, but I believe that the Tarot is one of the things that will survive the bottleneck of historical accidents that is forming up ahead of us temporally. The whole circumstance challenges me to winnow down my longwinded "teacherly mode" and present the skeletal structure, the unchanging bones of Western Esotericism as contained in the form that is Tarot. 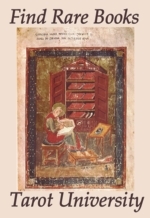 Much like the author of Meditations On The Tarot, who was motivated to provide a companion volume for that recondite grimoire of Tarot written by Mouhni Sadhu, I want to be sure that certain things are said in support of Tarot's historical Egreggore. Now that I've got that off my chest (whew! ), here's our Tarotlogy Spread for April of 2011. I'm using the Lombardy Tarot by Gumppenberg (AKA Soprafino, “superfine”), because it comes from a similar era as the time I'm currently exploring. This is a beautiful and refined Marseilles-style Tarot, very ornamental but not "illustrated" in the modern sense. There's not really a manual for this pack so I will just shoot from the hip and see what comes up as we go. This card makes it very clear that we are looking at a coin flipping in the air, mid-toss. At first I couldn't see which direction the card was facing, but upon closer inspection the male-figured coin is at the top, so I assume that means "heads" and we win the toss. Folding in the energy of Venus, the message seems to reinforce the theme of "returning to traditional values; embracing what has historically been understood as harmonious, good, true, and beautiful". If nothing else, this card suggests that we keep it simple (very low number) and stay in the present, making only one-step at a time. By reducing the larger confusion down to a series of individual steps (e.g. stay or go? now or later? alone or in company? ), Venus will lead us through the landscape as the openings present themselves. Remember to pay attention to the things that you are attracted to, and that are attracted to you. That is Venus' principle power, attraction and magnetism, the urge to join things together. Try to stay open to and/and solutions rather than always setting things up in either/or dichotomies. This card refers to the maximum degree of Fire, the Grand Trine embracing Aries, Leo and Sagittarius. This could be a comment on the massive Aries presence in this NewMoon chart; Mercury, Jupiter, NewMoon, and an Uranus/Mars conjunction; it’s a six-alarm conflagration, so to speak. The 10 of Wands doesn't automatically point to a disaster -- it often testifies to the completion of a huge and laborious project, which has demanded everything you had to give. There can be imitations of adrenal fatigue with this card, but when it's upright the cause is worthwhile and the individual sacrifices will make all the difference to the cause. It's a little bit curious to see this card just at the onset of spring (for the Northern hemisphere) but perhaps what is being said is that we should steel ourselves for a powerful dose of challenge, friction and chaos, as the force of dramatic change overcomes the inertia of old arrangements. Aries energies are no respecters of convention or past limitations, and Jupiter exaggerates and multiplies whatever he touches. So this card looks like a plethora of these fiery energies that have been set loose, bad or good. This is our second Deuce, reminding us to think about the Trump with the same number, the Priestess. She is the "better part of Wisdom"; reminding us of the most rewarding attitude we can take through this stage. Faced with a choice between two unknown possibilities, how do we form a basis for choosing? And in the case of this card specifically, should one respond to the seeming competition (or opposition, challenge, duality, split) with wrath, or with openhearted trust? I often see this card as the sparring partner or worthy contender, the person with whom we play and practice, who shows us our blind spots and unguarded flanks. When our sparring partner lands a good hit, knocks us down or catches us off guard, our response should be, "Good one! Thanks for the correction!" Considering that Mercury is currently the 'engine' for the train of this long and feisty Aries group, it can make a huge difference for the future if we can keep a positive attitude and look for the incoming growth potential rather than over-focusing on the obvious negatives. My motto is "Interpretation is Destiny", and this is exactly the principle at work with this card in this position. To the extent that we can practice the highest virtues of Mercury -- curiosity, playfulness, creativity, intuition, openness to new information, and a Tiggerish bounce that pops right back up after a setback, to that extent we'll probably do fine with the challenges of the moment. Nine is considered the "perfect" number in many traditions, because it settles out into a 3x3 grid. Even if there is activity and stress around all four sides of the grid, the center square is always calm and peaceful, undisturbed by external events. The classical meaning of the 9 of Wands reflects this very idea of "rest within labor". It shows the need for periodic breaks from a near-overwhelming task. Downtime is of essential when one is engaged in a long-term, absorbing project. Find a private interior space that is detached from externals and get some self-healing done. Resist becoming a needless sacrifice by trying to struggle on while punch-drunk. Not only are we counseled to turn our back on the struggle for a while, but we are also reassured that others will fill in for us while we take our time-out. Don't be abashed by concern for other's opinions in this matter -- he who fights and runs away lives to fight another day! This card comes down through history with the concept of inheritance attached. Through family connections one can be blessed with benefits like good nutrition, protection, education and intellectual curiosity, but one might just as easily receive burdens like personality disorders, drug addiction, and the propensity to make excuses. Clearly this Mars conjunction with Uranus is expressing how extreme and non-normal current circumstances seem to be. Nevertheless, don't let that make you lose track of your sense of proportion. It's even more important now to keep a level head and be mindful of the long haul. Mars in Aries is always in a hurry, he's always hustling people and circumstances along with his great sense of urgency. But as we are learning in Japan, slapping projects together fast-and-cheap, without consideration for the far distant future and the full range of possible challenges, gets us into trouble at a scale that's hard to come back from later. The 'orb of rulership' that comes along with this card (as seen in the hand of the Emperor) shows that the privilege of ownership and leadership includes the burden of responsibility for the well being of the enterprise. Noblesse oblige, even if your own nobility marks you as a victim too. Let's make one of those key-word combinations that we all learned about in our early Tarot training: This month, whether the coin falls heads or tails, it is wisest to follow your natural attractions and keep featuring the positive aspects of what you are being presented. A conflagration on the path before us is blazing like the Strip in Las Vegas, but it may also be destroying everything it touches as well. Don't put yourself in contention with this overwhelming force, but allow it's radiance to shine light into your own dark corners, so you can come awake to your true situation at this transformative time. Pace yourself; the long-term effort that will keep you safe and advance your cause can only be maintained if you give yourself enough interior cave-time for R&R and meditation. It is essential that you question all of your "givens" and make sure that you aren't entertaining parasites left over from past eras of your life. We want our energies clear and forward facing, so we can proceed into the new zodiacal year with optimism about what's ahead.